India’s information technology (IT) sector was expected to report the lowest growth in the September quarter since the 2008 global financial crisis. And, as things turned out, the reported numbers weren’t very different from expectations. According to data collated by Nomura Research, tier-I companies grew organic revenues by 7% in constant currency terms. Worse still, the broker points out, even operating profit margins are near six-year lows at around 23%. There may be some succour on the margin front, thanks to the sharp depreciation in the rupee recently, but considering that revenue growth remains a worry, margins too, could continue to be under pressure. “We remain cautious on margins despite recent rupee depreciation as pricing could stay weak in a scenario where ex the healthcare and auto segments, operating income growth for clients is sluggish or negative in 3QCY16," analysts at Nomura said in a note to clients. On the revenue growth front, top-tier firms reported numbers in line with analysts’ estimates; some such as Tata Consultancy Services Ltd missed estimates. “What started off as a challenge at the beginning of the year in the financial services vertical (due to decline in trading income and other revenue streams) steadily spread to other verticals. This was exacerbated by macroeconomic uncertainty topped off by Brexit," analysts at Kotak Institutional Equities wrote in a note to clients. 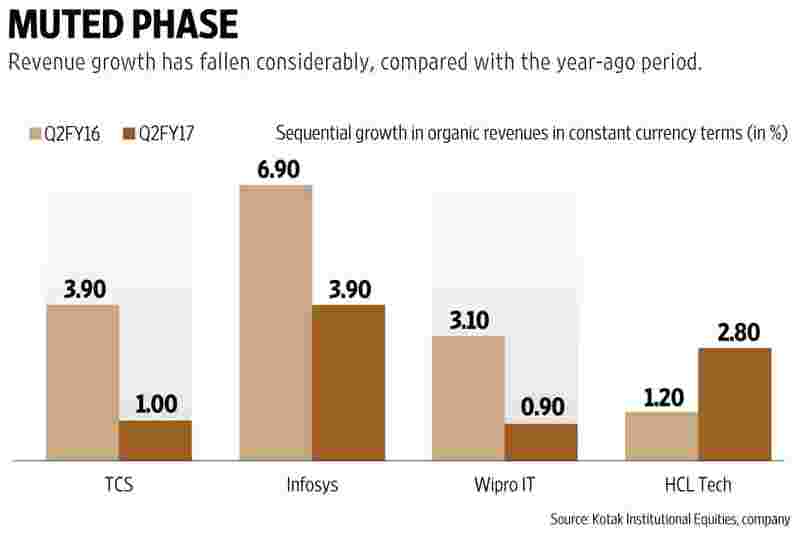 While Indian IT services firms are already struggling for growth, investors have additional worries. The election of Donald Trump has raised uncertainty for the sector; especially in the area of visas for IT professionals. Stricter regulations on visas are expected to hurt margins; and if the Trump presidency results in very harsh measures, even growth can be hurt. IT stocks have underperformed the broader markets this year. A small consolation is the fact that firms dependent on the domestic economy, unlike IT firms, have been hit worse by the government’s demonetisation of high-value currencies.